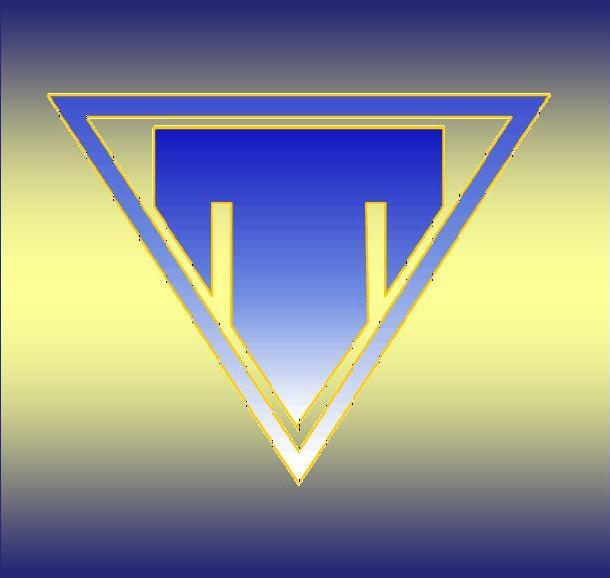 S. TOHAN S.A. Zarnesti, was established in 1938 as part of MALAXA industry group, reference group in the interwar period. Since its establishment, its production was intended exclusively to the army, but during the next years, production diversified according to necessities. From 1948 until 1990 the company has worked as UZINA 6 MARTIE Zarnesti, and from 1990 until 1998 the company has worked as UZINA MECANICA TOHAN Zarnesti. 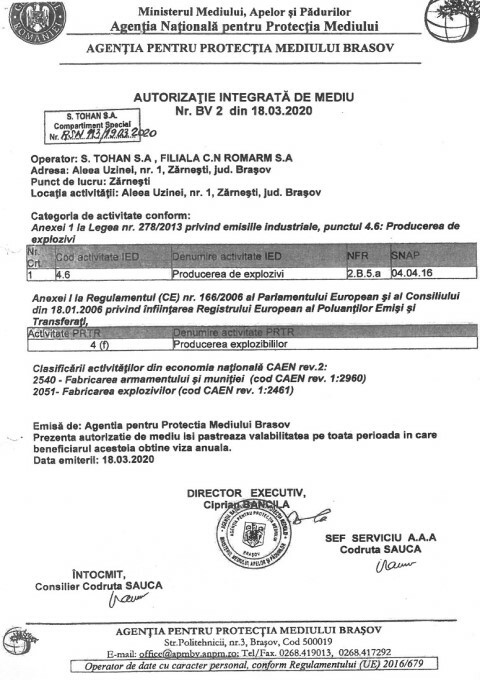 Currently, S. TOHAN S.A. Zarnesti is Romanian legal person, established as a subsidiary of N.C. Romarm S.A. Bucharest, according to the Government Decision no. 979/2000, amended and supplemented by the decision no 952/2001. As a result of research and design team work and production capacity development, the products made meet the requirements of our business partners. At the same , efforts are being made to increase technical and organizational capabilities, to adapt to new requirements arising from the entry of Romania into NATO, reaching anti-pollution standards, labour safety and other requirements arising from Romania's EU integration in 2007. 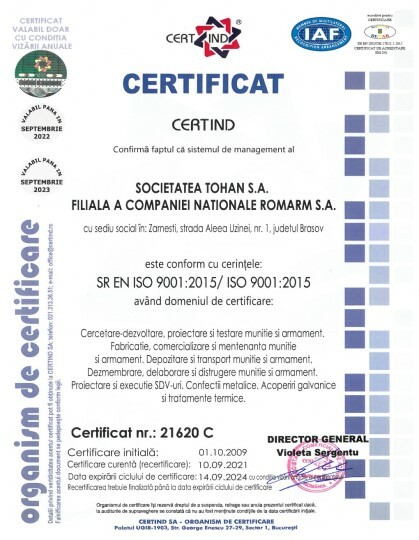 All the products and services of the company are made based on the quality system certificate by CERTIND: AQAP 2110:2006 and SR EN ISO 9001: 2008. 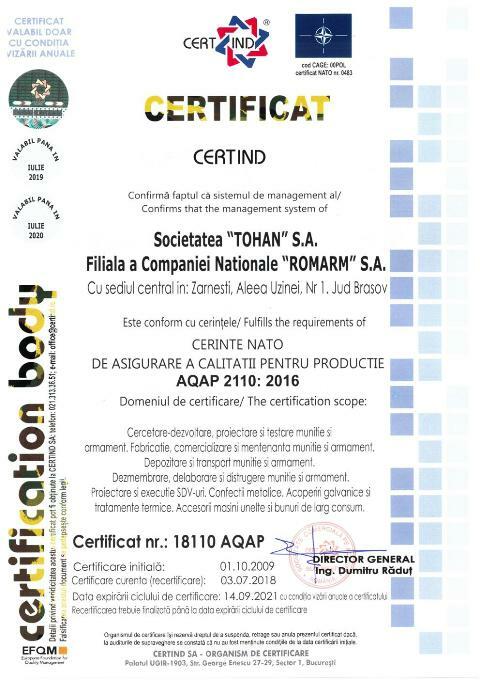 S. Tohan S.A. is headquartered in Zarnesti, Brasov county. Zarnesti lies in central Romania, at a distance of 25 km from one of the most important industrial centers of the country, Brasov. The company is located in the foothills of Piatra Craiului Mountains, an area of great beauty. In neighboring you can find medieval monuments and relics such as Rasnov Citadel, and Bran Castle, which is bound to the well known legend of Dracula character. Authorization of S. TOHAN S. A. can be accessed here.